Lutheran High School is pleased to announce its Honor Roll for the second quarter of the 2018–2019 school year. Seniors: Joey Chau, Miranda Dunn, Jake Graham, Garrin Hartson, Brett Reid, Noah Wood, Sarah York; Juniors: Parker Barnett, Noah Brandt, Keegan Conlin, Tristan Daniels, Layton Dickey, Jace Dugan, Marcus McFadden, Jackson Pasch; Sophomores: Joe Faubion, Sean Graham, Emily Harris, Caleb Johnson, Heather Kremer, Thomas Leslie, EJ Wilkes; Freshmen: Spencer Barnett, Riley Bauer, Jacinda Cobin-Byerly, Kayla Dinsmore, Thomas Erdmann, Gage Fortner, Avery Hayes, Jacob Kelley, Sean Moore, Trey Patterson, Alyssa Taylor, Jackson Terry, Molley Wilkins. The faculty of Lutheran High congratulates these students on using their God-given talents to His glory and their self-betterment. Lutheran High School is pleased to announce its Honor Roll for the first quarter of the 2018–2019 school year. Lutheran High School is pleased to announce its Honor Roll for the fourth quarter of the 2017–2018 school year. Seniors: Tommy Dai; Daniel Leach; Josh Maple; Luke Sabine; Carson Thomas; Juniors: Hailey Black; Elayna Brock; Mark Caster; Jake Graham; Garrin Hartson; Evan Rudicle; Sarah York; Sophomores: Mitchell Burke; Keegan Conlin; Layton Dickey; Olivia Henderson; Olivia Jackson; Gracie Kowell; Jackson Pasch; Freshmen: Joe Faubion; Caleb Johnson; Trey Lawrence; Micah Mattes; Luke Montgomery; Adele Schwartz. 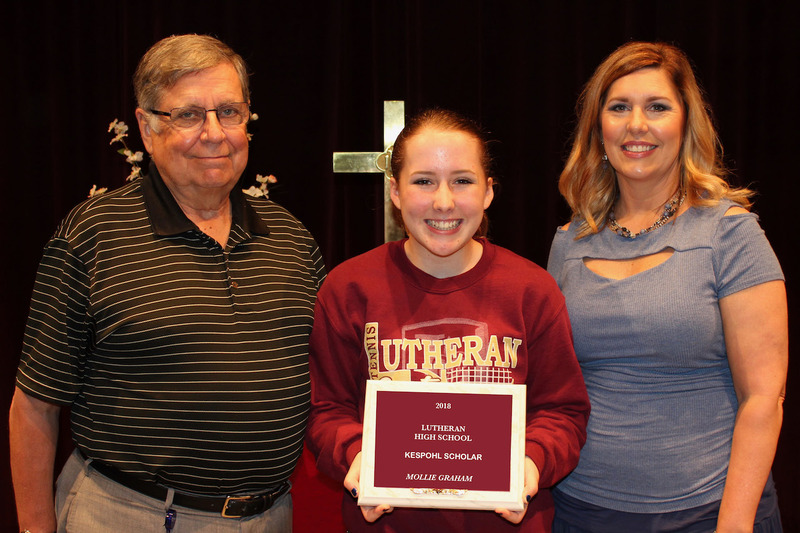 Lutheran High School students were honored for their academic achievements at a special Convocation on Thursday, May 3. Certificates handed out include those awarded for excellence in various subjects and on national tests; participation in clubs and committees; and outstanding attendance. In addition, a number of special awards were presented. 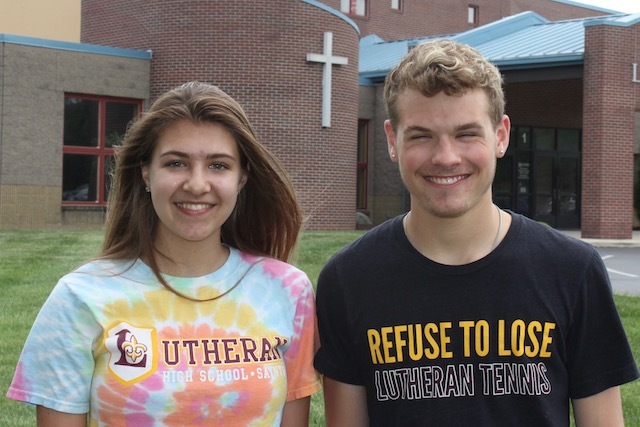 Lutheran High School is pleased to announce its class of 2018 valedictorian Janessa Schaefer and salutatorian Ted Deitz. Read more about Janessa and Ted. Shelby Hedges and Charlie Moffitt were presented the Mental Attitude Award for 2018; Janessa Schaefer and Ted Deitz were named the Senior Scholar Athletes; and Erin Pasch and Emeka Jillani are the Senior Athletes of the Year. Read about the special Athletic awards. Jerry Roesener and Daryn Wilkins presented the Henry Arnold Kespohl Scholarship to junior Mollie Graham at the final chapel service of school year on Monday, May 21. Mr. Roesener is the grandson of Henry Kespohl and Mrs. Wilkins is his great-granddaughter. Find out more about the Kespohl Scholarship.